A new study, led by scientists at the Institute of Vertebrate Paleontology and Paleoanthropology (IVPP) in Beijing, China, including University of Bristol Ph.D. student Zhang Hanwen, examined the feeding habits of ancient elephant relatives that inhabited Central Asia some 17 million years ago. 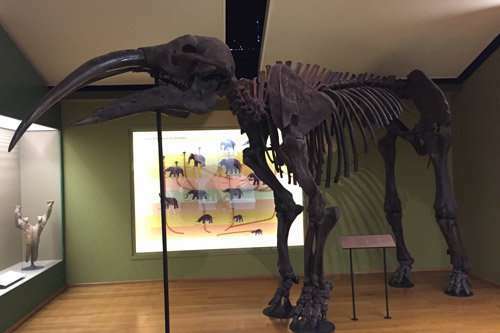 Zhang Hanwen, from Bristol's School of Earth Sciences, added: "Gomphotherium was most obviously different from modern elephants by its very long lower jaw that still had lower tusks. "It also had a shorter, more elongate, barrel-like body shape compared to modern elephants. In essence, a small elephant with short legs." To understand if feeding preference was playing a role in survival and extinction of these elephants, Dr. Wu Yan of IVPP, the study's lead author, analyzed tiny remnants of plant matter found stuck to the fossil teeth, called phytoliths. 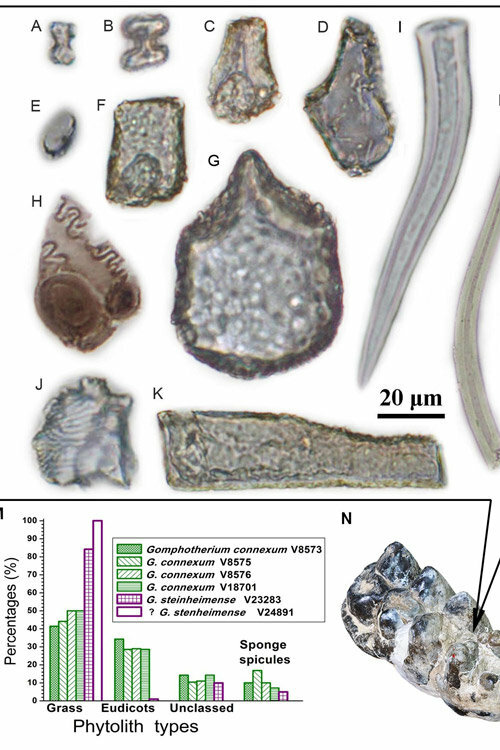 Dr. Wu said: "Given that foliage naturally produces far less phytoliths than grasses, this indicates that G. connexum was mainly feeding on foliage, maybe a generalist feeder of all kinds of plant matter. "When I examined the phytoliths extracted from the cheek teeth of G. steinheimense, I saw a very different pattern—grass phytoliths comprise roughly 85 percent of the total, suggesting this species was perhaps primarily a grazer 17 million years ago." Zhang Hanwen added: "Now things start to get interesting. When our team analyzed fossil pollen samples associated with the sediments where the Gomphotherium teeth were found, we realized that woodlands were rapidly transforming into semi-arid savannahs when the two species lived together. "Our new evidence shows that the diet switch from leaves to grass happened long before the anatomical switch in tooth shape."